Delacroix’s "Medea About to Kill Her Children (Medée furieuse),” 1838, Palais des Beaux-Arts, Lille. This painting offers a staggering contrast to Greek theatre, where the violence occurs offstage and is reported by a Messenger. Here Delacroix shows us something audiences have never seen: Medea about to claim her children’s lives. To see the unthinkable act, Medea’s madness, and the children’s fear was almost more than I could bear. Such is the emotional realism of Delacroix. I first experienced the singular glory of Eugène Delacroix (1798-1863) at Philadelphia Museum twenty years ago. In the years since I’ve continued to thrill at his name and the occasional sighting, but lost touch with the source of my original awe and confess to wondering if it wasn’t partly the ardor of a nineteen-year-old. When I got back from The Met’s newly opened Delacroix on Sunday—the first full retrospective mounted in North America, organized with the Louvre—I was as rapturous as the first time, drunk on Delacroix. Along for the ride, my three-year-old had blessedly passed out on arrival and was parked her between galleries as I inhaled the best museum hour I’ve had in years. It took about three seconds of revisiting the master’s wildly theatrical works—all tangled bodies, black eyes and teal seas—to remember why I had fallen in love. Adding to my heightened appreciation for Delacroix’s “belief in the expressive power of painting” is an impressive new one-woman show about Artemisia Gentileschi, an Italian Baroque Painter (1593-1653), out-shadowed by Caravaggio (1571-1610) in spite of her comparable skill. 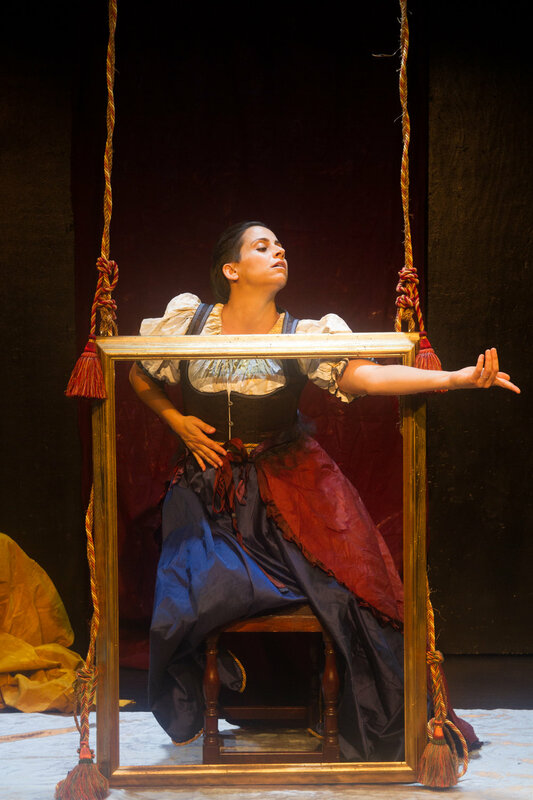 Artemisia’s Intent, devised by The Anthropologists, directed by Melissa Moschitto and starring the always compelling Mariah Freda, sets the record straight about the painter’s genius, and what it cost her. Artemisia Gentileschi’s “Judith and Her Maidservant with the Head of Holofernes,” between 1623 and 1625, on display at the Detroit Institute of Arts. Moschitto took a pilgrimage to see this masterpiece last January and it inspired the opening scene of the play. You can ask me a million questions—I’m never going to say anything different. I never have said anything different. I say this, that everything I have said is the truth, and that if it were not the truth I would not have said it. Yes, sir. I am ready to confirm my testimony even under torture. The omni-talented Mariah Freda as Artemisia. Photo by Jody Christopherson. With Greece still on my mind—my Acropolis tour guide’s heated words about the Turks, the statue of Bouboulína in Spetses—I was staggered by this painting’s passionate expression of European values over barbarism. The French artistic elite were invested in Greek independence, a cause célèbre of post-Revolutionary France. Delacroix’s “Michelangelo in His Studio,” 1849-50, Musée Fabre, Montpellier Méditerranée Métropole. Delacroix tested himself methodically and patiently throughout his four-decade career, seeking first excellence, then fame, then truth. At a time when the mutual reverence between poets and painters was ardent, the literary canon gave Delacroix scenes for many of his masterpieces. I learned the word ekphrasis at my alma mater, St. John’s College, while discussing the poet W. H. Auden’s gut-punching masterpiece Musée des Beaux Arts. In loosest terms it means any piece of art that takes another as its subject. Artemisia’s Intent the play and Delacroix the exhibit are both shrewdly written testaments to the power of artistic exchange. Doubling down on creative impact, they give you more than the beauty of a single medium—and history lessons to boot—for the price of a ticket less than lunch. See them. Mariah Freda as Artemisia. Photo by Jody Christopherson, 2018. “Susanna and The Elders,” 1610, Schloss Weißenstein collection, Pommersfelden, Germany. Her first painting that is signed by her but was commonly attributed to her father, Orazio Gentileschi. Woman according to Delacroix. I think Artemisia would approve. 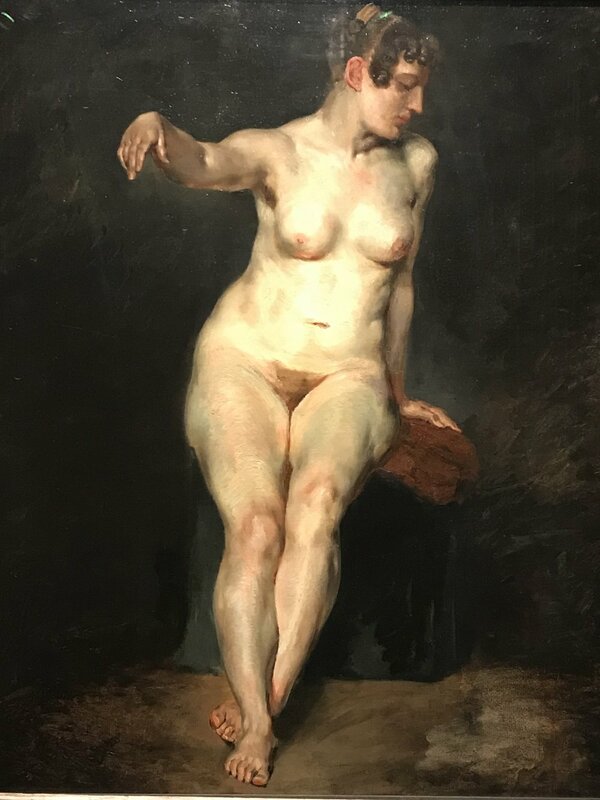 “Female Academy Figure: Seated, Front View (Mademoiselle Rose),” 1820-23, Staatliche Museen zu Berlin, Nationalgalerie.